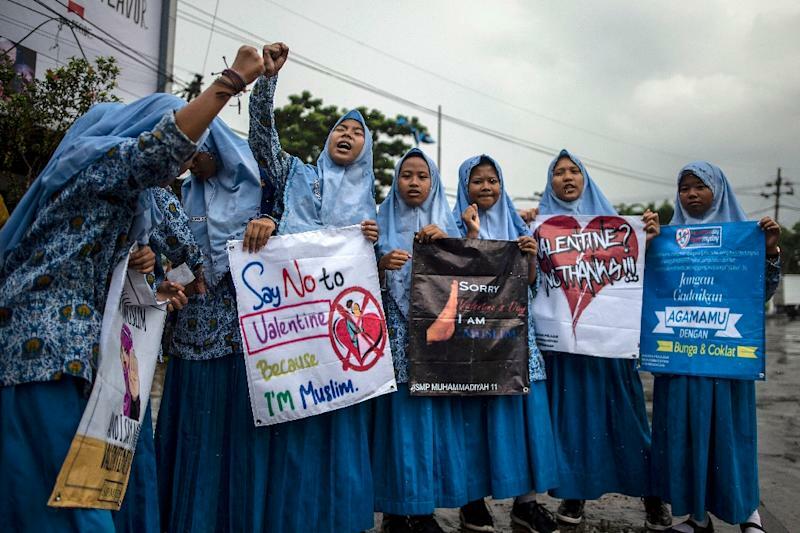 Valentine's Day wasn't getting much love in the world's biggest Muslim majority nation Thursday as Indonesian authorities urged amorous couples to call it quits and carried out raids to quash any wayward gift-giving. "Say no to Valentine's now!" chanted the high schoolers, most of them teenaged girls in hijab head coverings. Some held placards with phrases like "Sorry Valentine's Day, I am Muslim". "We want to remind our young generation not to be caught up in Western culture," he told AFP. Authorities conducted raids in Surabaya, and Makassar city on Sulawesi island to snuff out any celebrations. In conservative Aceh province -- the only place in Indonesia that imposes Islamic law -- a fresh Valentine's prohibition was issued, citing religious norms. While Valentine's was off the cards for some, many Indonesians practise a moderate form of Islam and celebrate the day with chocolates and flowers for their loved ones. Meanwhile in India, more than 10,000 schoolchildren, some as young as six, made a Valentine's Day pledge not to marry without their parents' consent. Some 10,000 pupils aged six to 17 and even some teachers took a vow at 25 schools to "love and respect their parents till eternity" in the western state of Gujarat -- the stronghold of Hindu nationalist Prime Minister Narendra Modi. "I will always respect their decision because no one in the world has sacrificed for me like them," said student Samadrita Banerjee. Elsewhere, a school association in the southern state of Karnataka alerted teachers and parents to ensure children did not celebrate Valentine's Day by bunking classes to go to shopping malls or the movies, The Times of India newspaper reported.